we do have exhibitions during summer season. Poetry exhibition of Erkin Ilguzer was held summer 2004 named "recycled art"
Cafe Olive is located in the Village of Akkoy where on the crossroads of Milet - Priene - Didyma have been important civilizations in the ancient history. The Name "Olive" inspired from the immortal tree of Aegean and Mediterranean culture in Latin. Akkoy is a village on the South-west of archaic Miletus city (the center of Ionian philosophy) in the western part of Asia. The name of it is derived from Turkish. 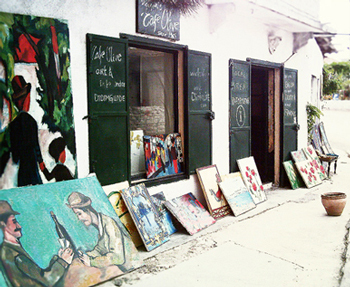 As the walls of the houses are made of local white stone, it is called "Akkoy" ("Ak" white + "koy" village), Cafe Olive is located in Akkoy Village on the crossroads of those important historical centers where you can try home made goods, olive oil and visiting our art gallery on your way to Miletos. Mostly the diversity of colours, village life, the Aegean nature with its sunlight and landscapes and the Mediterranean Aegean view of life were the inspirations for those artworks. With the admire for Paul Cézanne, who lived in the Provence and catched the beauty of village life, those pictures are following the "Cézannism", like in 1912, when Cézanne created by the invention of his new style the era of "Cézannism". A lot of painters, also known ones tried to copy his painting style. Also Picasso and George Braque were in their beginnings inspired by Cézanne. Looking carefully at the following pictures, those basically "Cézannism - reproductions" but also early Picasso inspired oil paintings are carrying a kind of individual touch. If You are interested in seeing those pictures, we are happy to welcome You at the Café Olive Gallery in Akkoy, where all those pictures have been painted.